A country whose ancient cultures and magnificent landscapes reflect an extraordinary past that has left an indelible mark on the land, the people and their monuments. This is Ethiopia-it is a past that began at the beginning of time in the very birth place of mankind. Religion has always been a major influence in Ethiopia. Certainly no country in Sub-Saharan Africa can trace its origins as far back Ethiopia is mentioned thirty there times in the holy bible and many times in the holy Qura’an. Perhaps this is the reason why so many visitors retrace the “historic route’, drawn by colorful stories and fantastic tales to the land once known as Abyssinia. There is nothing in Sub-Saharan Africa and in a sense anything else in the world that prepares the visitor for the wealth of historical and cultural treasure, both ancient and living, contained in Northern Ethiopia. 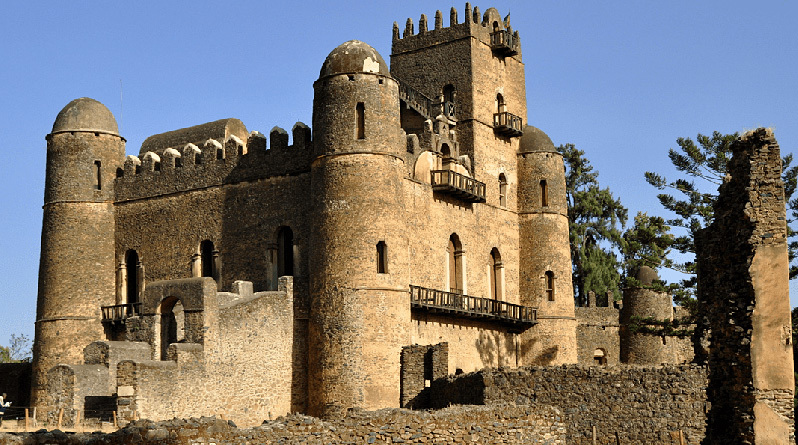 The historic routes pivot around four cities in the north, namely Axum, Lalibela, Gondar, Bahirdar and the walled city of Harar in the east, all are very different to others. Day 5.Gondar-Simien Park– After breakfast drive to Debark (100 Km from Gondar) where the park headquarter found to get permission and scouts. 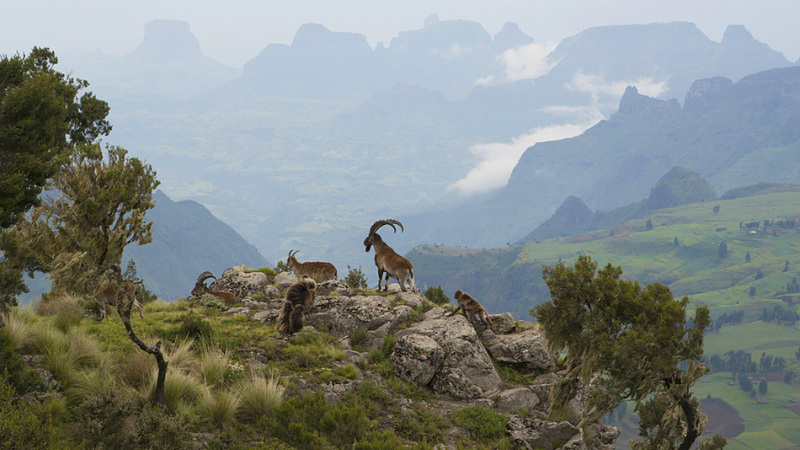 Then continue to drive another 20km then make a short walk/trek and spend the day visiting the Simien Mountains National Park (registered by UNISCO as a world heritage site, with endemic & mammals, birds, natural vegetation, & wonderful landscape). Later in the early evening, you may make a short walk around Sankaber or rest. Overnight in a hotel. Day 6. Debarq-Axum– Right after breakfast, an early morning drive will take you to Axum (270 Km from Debark) through the Simien Mountains & magnificent topography & scenery, the Limalimo Gorge, Tekeze Valley. You will arrive in Axum late in the afternoon. You will check into a hotel and take a break. Overnight in hotel. Day 9.Hawzien (Tigray Rock-Churches)-Mekelle- Early Morning After breakfast, you will visit AbuneYemata is one of the most majestic and historical churches in Gheralta a village called Megab. It can be reached 5km drive from west of Megab and a further 30 minutes’ walk to the foot of the perpendicular rock mountains of Guh (name of the area). The interior of the church can be reached after climbing 5m tall vertical ascent where there are no ladders; no ropes and no hope if someone fall, and pass by a most terrifying narrow ledge carved in the cliff which is approximately 250m to 300m high. This rock is notable for its extensive and perfectly preserved wall and ceiling frescoes of Old and New Testament stories, thought to date from the 15th century. The annual festival is taken place on the 8th November. After that you will also visit Debre Mariam Korkor, Which is one of the biggest and most complex rock-hewn churches of Tigray situated in the village called Megab. About 1 and ½ hours walk and climb from the village it brings you to the white washed faced of a built structure church facing to the West. The interior part of this church is decorated with magnificent paintings such as paintings depicting Archangel Ruphael which is reported by Gerster to be “similar to the painting in the cathedral church of Faros”. And another painting on the Western wall shows the Virgin Mery with a circle around her abdomen which according Ivy Pearce indicates the development of Christ in Utero and such a theme was common one in 17th century Byzantine art.Overnight in a Hotel. Day 10. Mekelle-Lalibella– After breakfast, you will be driven to Lalibela (470 Km from Mekele) through the Ambalage Chain of Mountains. Your arrival in Lalibela will be late in the afternoon. Overnight in a hotel. Day 11: Visit the Rock-Hewn Churches of Lalibela – After Morning Breakfast you will start your visit to the famous rock churches of Lalibela-the “Ethiopian Jerusalem”. Each church (“Bet”) has a unique architectural style. All are superbly carved and most of them are decorated with well-preserved paintings. Visit the northern group of churches. Bet MedhaneAlem is the largest monolithic rock-hewn building in the world, supported by 72 pillars. Through a short tunnel you pass on to Bet Mariam. Bet Golgotha and Bet Mikael contain many important religious items. Bet Giyorgis is the last one of the churches, built after St. George appeared in the dream of King Lalibela. It displays the finest architecture in a good state of preservation. Overnightin a hotel. Arrive at Bole international airport and meet and assist by ET-holidays representative. Depending on your arrival time, you will have Addis Ababa city tour. Addis Ababa sightseeing will include Mount Entoto for the panoramic view of Addis Ababa, National museum: home for the oldest and famous hominid fossil ‘Lucy’, Trinity cathedral church, Ethnographic museum the then palace of Emperor Hailesillasieknown as little Ethiopia and Merkato: the biggest open air market in East Africa. Along the way you will visit significant historical monument of Addis Ababa. After breakfast, another short flight will take you to Lalibela. Upon arrival, you will be met by our tour guide, drive to a hotel where you will check and rest for few minutes. Then you will start your visit to the famous rock churches of Lalibela-the “Ethiopian Jerusalem”. Each church (“Bet”) has a unique architectural style. All are superbly carved and most of them are decorated with well-preserved paintings. Visit the northern group of churches. Bet MedhaneAlem is the largest monolithic rock-hewn building in the world, supported by 72 pillars. Through a short tunnel you pass on to Bet Mariam. Bet Golgotha and Bet Mikael contain many important religious items. Bet Giyorgis is the last one of the churches, built after St. George appeared in the dream of King Lalibela. It displays the finest architecture in a good state of preservation. Dinner and Overnight at Top Twelve Hotel. Named after its geographical location and the famous Omo River, the South Omo zone is spectacularly beautiful area with diverse attractions, ecosystems, cultures and languages. The Omo Valley is a cultural melting pot with at least 16 distinct ethnic groups. Two of the four main African linguistic families are represented in the area: Nilo-Saharan and Afro-Asiatic, with its omotic (endemic to the South Omo) and Cushitic branches. The Omo is one of Ethiopia’s largest rivers. Rising in the highlands of south-west of the capital of Addis Ababa, the Omo courses south for almost 1000kilometers but never reaches the sea. It’s the sole feeder of Lake Turkana, East Africa’s fourth largest lake, which it enters just above the Kenya border. Some of the tribes live alongside the Omo River and depend on it for their livelihood. Cattle, goats and sheep are vital most tribes’ livelihood, producing blood, milk, meat and hides. Cattle are highly valued and used in payment for ‘bride wealth (dowry). Bee keeping is widely practiced and honey is used as household food and to generate income. Milk is mainly for household consumption. Butter, however, is sold in markets and used as face, hair and body cream, as well as in various rituals. Morning visit the daily local fish market at the shore of Lake Awassa. This market will give you an experience where local people enjoy different variety of fish cuisines including the Ethiopian version “Sushi”. Here, a lot of aquatic birds can be spotted. Then, proceed driving to Addis Ababa. En route, visit the birds on Lake Ziway, including one of the largest birds: the marabou stork. In the evening you will have fare well dinner at traditional restaurant and departure back to home. The Danakil Depression is found in the Danakil Desert, along the borders of Eritrea and Djibouti. With average temperatures of 35°C – there are days when temperatures exceed 48°C – and an average annual rainfall of between 100 and 200m, it is rightly considered one of the most inhospitable places on earth. The National Geographic went so far as to call it the cruelest. Situated at the head of the African Rift Valley, in the Afar Triangle, on the so-called triple point, the Danakil Depression constitutes one of the lowest places on earth, it’s 100 below sea level depression the direct result of the retreating actions of the Arabian and (two halves of) the African plate. Located thus, the area is especially volatile; the earth’s crust especially thin, the resultant volcanic activity the explanation for the depression’s extraordinary landscape – cones, shields, lava, geysers and salt pans. Day 04 : Drive to Kusrewad and Erta Ale. 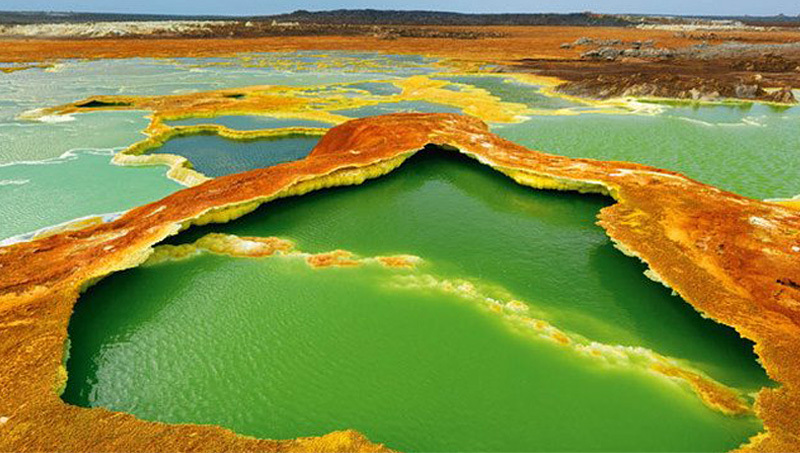 Day 06 : Dallol Salphur spring, Lake Assale Salt Bar and camel caravans. Morning transfer to the air port and fly back to Addis Ababa. Then you will have a sightseeing tour. You will begin your visit from the National Museum, one of the most important sub- Saharan museums in all of Africa. The museum is home to the fossilized humanoid Lucy, as well as an amazing collection of artifacts, royal items and art. We then visit the Ethnological Museum, which was the former palace of the late Emperor Haile Selassie. PM we take time in St. George Cathedral, built in 1896 by Emperor Menelik and then continue on to Holy Trinity Cathedral. Holy Trinity Cathedral is the largest Orthodox Church in Ethiopia and has survived through many historical periods, as its interesting architecture can attest to. The Cathedral contains the thrones and the tombs of the emperor and some of the royal family. Visit Merkato, the largest open air market in Africa. Evening transfer to airport for your departure. Drive to Hamedela via Berhale (639 meters above sea level). The Danakil Depression can be said to ‘begin’ here. It is one of the most inhospitable regions of the world, but is nonetheless spectacular, full of eye-catching colors, as in the sulphur springs. The desert has several points lying more than 100 meters (328 ft) below sea level. You pass through a small town of Berhale where the camel caravans stop before they proceed to the northern highlands. 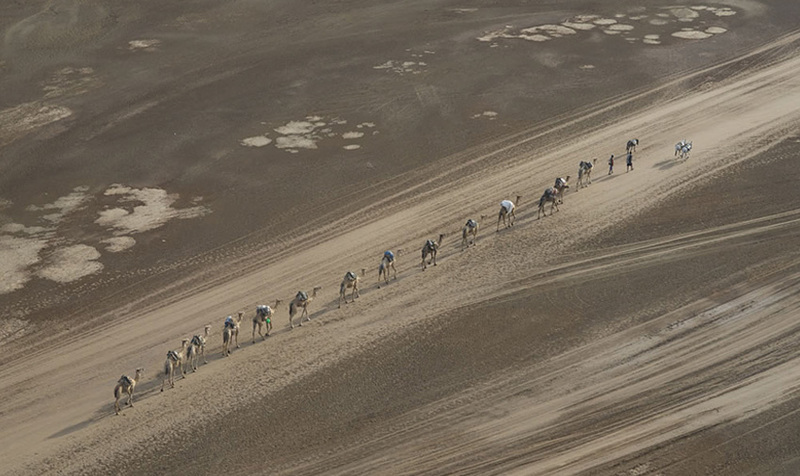 En route you see many long caravans going to the salt mines and others coming out of the Danakil with their salt loaded camels. (3-4 hrs drive) Camp at Hamedela. We start early, shortly after a 06:30 breakfast, and drive to Askoma (150 meters) at the base of new Erta Ale. The 80 km distance may take about 6 hrs passing through changing landscape of solidified lava, rock, sand and the occasional palm lined oasis. You pass several small hamlets scattered here and there in this desert land, before reaching Askoma village or parking area. You will trek from Askoma to the new Erta Ale which takes about 3 hrs. It is a 9 km trek from Askoma to Erta Ale. Early dinner around 17:00 and trek up to the new Erta Ale reach around 20:00. Camels transport all the camping materials and some food, sleeping materials, mattresses and water, to the rim of the volcano, where we spend the night watching the dramatic action of the boiling lava. New Erta Ale ranks one of the most alluring and physically challenging natural attractions anywhere in Ethiopia. It is a shield volcano with a base diameter of 30 km and 1km square caldera at its summit. New Erta Ale is part of the world’s only permanent lava lake and you will spend an unforgettable night on the top of the mountain. The magma flow moved 3.5 kms south from old Erta Ale to the New eruption point. Early morning you will rise with the sun with time to walk around pits and craters. The main pit-crater 613 meters above sea level/, 200 m deep and 350 m across, is sub-circular and three storied. The smaller southern pit is 65 m wide and about 100 m deep. You will leave around 7:00 to head back to Askoma for breakfast. You will reach latest at 10:30 am at the camp and after some time to relax you will drive to Lake Afdera (optional may not be available during summer time) the mythical Lake Giulietti (or lake Afrera), a salt water lake located more than100 meters below sea level, in one of the deepest depressions of the planet. Because of the pictureqsue landscape, it is interesting to visit the salt flats where the Afar people obtain the salt by evaporating the water of the lake.on continue to Hamad Ela, a village with a total population about 500 people. Over night camping at Hamed Ela. Day 4: Morning driving tour to Ragad (Asebo), the place where the salts are mined. Observe the breaking of the salt from the ground, cutting into rectangular pieces and loading on camels. You drive ahead to Dallol (-130 m) and visit the difference landscape formed by volcanic activity, Dallol + Lake Assal (-130 m) + camel caravans (No camel caravan on July, August and early September) . Excursion to Dallol (116 meter below sea level, one of the lowest places in the world) colorful salts mining, visit Lake Assal, follow up camel caravans and walk with the Afar people. Drive back to Hamedela and proceed to Mekele. Day 5: Fly back to Addis Ababa- Morning transfer to the air port and fly back to Addis Ababa. Then you will have a sightseeing tour. You will begin your visit from the National Museum, one of the most important sub- Saharan museums in all of Africa. The museum is home to the fossilized humanoid Lucy, as well as an amazing collection of artifacts, royal items and art. We then visit the Ethnological Museum, which was the former palace of the late Emperor Haile Selassie. PM we take time in St. George Cathedral, built in 1896 by Emperor Menelik and then continue on to Holy Trinity Cathedral. Holy Trinity Cathedral is the largest Orthodox Church in Ethiopia and has survived through many historical periods, as its interesting architecture can attest to. The Cathedral contains the thrones and the tombs of the emperor and some of the royal family. Visit Merkato, the largest open air market in Africa. Evening transfer to airport for your departure. The popular legend of coffee in Ethiopia starts with a boy called Kaldi, a goat herder who discovered the energetic effect of coffee unexpectedly. Kaldi noticed the exciting prancing of his goats and decided to try the beans himself. Enjoying its stimulating effect he shared his findings with the surrounding monks in the monastery who found the uplifting effects of coffee to be beneficial in keeping them awake during their spiritual practice. The rest like they say is history. With ample rainfall, appropriate temperature, and fertile soil, Ethiopia grows varieties of washed and sundried/natural Arabica coffees in East, South and Western parts of the country. Ethiopian farmers cultivate coffee in four different systems-forest coffee, semi-forest coffee, garden coffee and plantation coffee. Centuries of local knowledge of coffee cultivation, growing process emphasizing intrinsic qualities, and the country’s incredible geographical and cultural diversity are some of the reasons for the different and unique favor varietiesavailable in the market. Among the most sought after, well known coffee types in the country are Sidama, Harar, Limu/Jimma, Yirgacheffe and Bebeka. Trinity Cathédral Church :-A beautiful church with a baroque style of European architecture which is unique to both Ethiopian and Africa and is dedicated to the Holy Trinity. Ethnological Museum:-It is founded in the main campus of the Addis Ababa University by the institute of Ethiopian studies with the aim of to preserve the country’s historical and cultural heritages. It has complete collections that describe almost all the tribal groups in Ethiopia. Entoto Mountain :-It is the highest pick in Addis with an altitude of 3200 meters, which was the site for the first palace of Emperor Menilik II the founder of Addis Ababa .Here there is St.Marry church, here Emperor Menilik crowned in it and you will admire the panoramic view of the city with its surrounding forests with its breathe taking site. Merkato :-It is the largest open- air market in Africa and you will enjoy the Ethiopian trade exchange tradition in the open air. 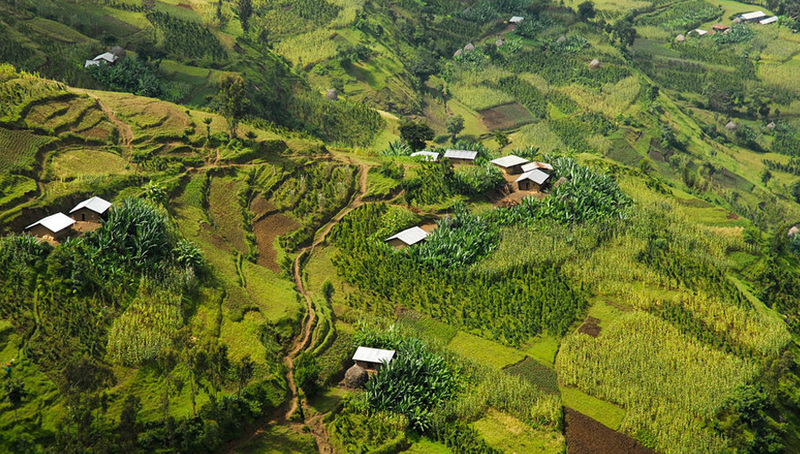 You’ll start the journey towards the western coffee region of Kaffa. First, we will visit Mt Menagesha, 3,400 m, an extinct volcano, which hosts the Menagesha State Forest, one of the oldest reforestation projects in the country. Here you take a short walk to experience the special flora.Later, we will drive through the city of Addis Alem, where Emperor Menelik II wanted to build the new capital because of wood shortages in Addis Ababa. On the Mt Wenchi, we will take a hike through another extinct volcano further south, see the hot springs, and visit the monastery island that lies in the Crater Lake by boat. After a short ride and a half an hour walk you’ll reach the origin of coffee plant, from which all other coffee plants derive. This is the real birthplace of coffee. In order to start the morning caffeinated, we will have a morning coffee tour around Bonga on the way to Jimma. Up on arrival at Jimma, you will be taken to the former palace of the Kaffa king Abba Jiffar II who died 1933. 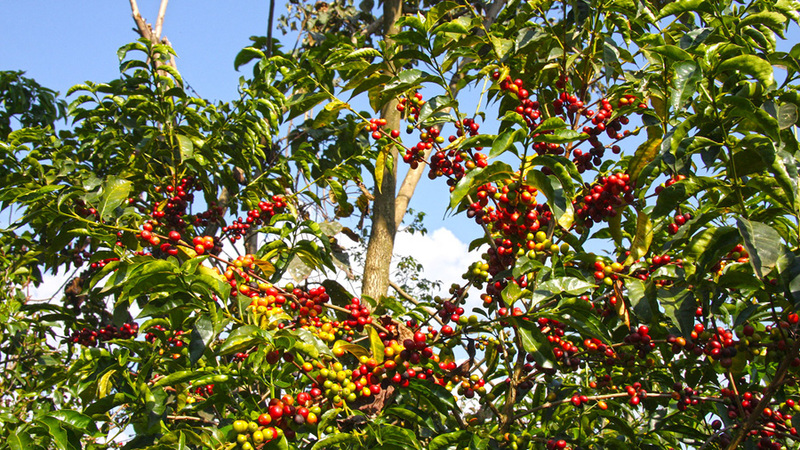 The environs of Jimma produce a large part of Ethiopian coffee. Today is a long trip to visit the other best coffee plantation area of the Yirgachefee. So we will pass through Sodo to get Awassa. Overnight hotel. After breakfast drive to Yirgacheffe, where one of the most popular coffees in the world is harvested. In this area, several coffee cooperatives with lovely plantations can be seen. The interesting aroma, full of citrus, and also floral notes – making Yirgacheffe one of the best growing coffee in the world. In the late afternoon you reach the beautiful Aregash Lodge which is surrounded by coffee plants, forests and wilderness. An ideal place for coffee lovers to relax and to let fade away your day. In the morning, you will visit the bustling fish market at Lake Awassa. And then continue driving to Addis Ababa. For lunch you have a short break in the small town of DebreZeit/Bishoftu. The city is situated around several small crater lakes and a popular day trip destination for locals of Addis Ababa. In the evening, we will invite you to a farewell dinner with presentation of traditional dances and music and it will be end of the trip. Take an early morning flight from Addis to Jimma and enjoy a beautiful drive through the Kaffa region to Bonga (125 kms) where you will check into your hotel and freshen up. After lunch take another drive through the countryside to the marvelous Tatmara coffee plantation where you will be able to experience and observe the whole coffee production process “from seed to cup” and of course enjoy a coffee ceremony at the end as you taste the coffee! Return to Bonga and your hotel for the evening. Rise early in the morning to the smell of locally grown and freshly roasted coffee and savour the taste as you enjoy a remarkable breakfast. Drive to Mankira the actual place where Arabica coffee was discovered. En route you will visit the magnificent and ancient AdarachaMedhanealem Church and the Natural Bridge Gurguto/EgziherDildy (meaning God’s bridge), which connects two distant villages. Late afternoon, enjoy a fantastic walk in the lush forest to the spectacular Barta Waterfall – crossing the river. The height of the waterfall can reach up to 100 meters but is dependent on seasonal rainfall and may vary according to time of visit. Sometimes if you are lucky you may observe a mist that has formed a rainbow over the waterfall and is a beautiful sight to behold. You will then complete the day tour, driving back to Bonga for Dinner and the evening at your hotel. Early morning after breakfast proceed by vehicle back to Jimma and your return flight to Addis Ababa. Guassa Community Conservation Area, located along one of the most significant historic routes in Ethiopia, offers spectacular Afromontane landscapes on the Guassa Plateau. Trek on foot or travel by mule to experience Ethiopia’s unique natural and culture heritage and traditional village life in the Ethiopian highlands. 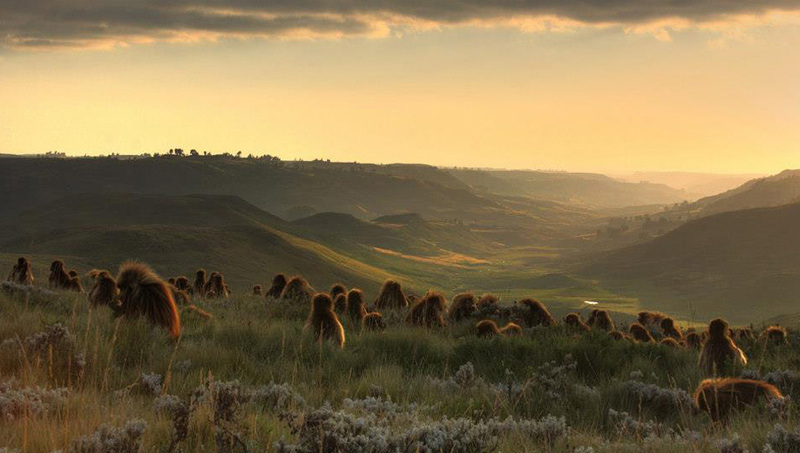 Discover breathtaking views filled with endemic birds and mammals such as the iconic Ethiopian wolf and the charismatic gelada. Guassa Community Conservation Area is found 260km northeast of Addis Ababa by road. 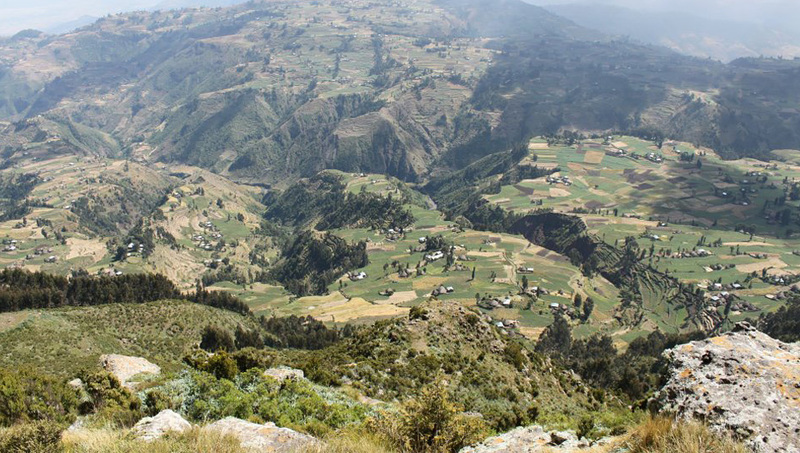 The area is among the Ethiopian highlands’ most pristine and secluded natural wonders. Along the 90-minute drive (80km) from Tarmaber, the hustle and bustle of urban life fades into the slower pace of a traditional Menz village. Day 1: Visitors arrive at the Guassa Community Lodge at Regreg around lunchtime to meet their guide and check in.After a rest, visitors take a short trek on foot or mule back to the nearby mountaintop. This idyllic spot offers genuinely stunning views over the Guassa plateau and the chance to spot the Ethiopian wolf. Along the trail, the guide will describe the natural surroundings as well as the local history and conservation efforts.Visitors will end the day back at Regreg, where they will be briefed about the upcoming treks. Day 2: After an early breakfast, visitors trek for two hours to SefedMeda before driving back to Addis Ababa or onwards to the historic north. Day 1: Visitors arrive at the Guassa Community Lodge at Regreg around lunchtime to meet their guide and check in.After a rest, visitors will take a short trek to the nearby mountaintop. This is an idyllic spot which offers genuinely stunning views over the Guassa plateau and the chance to spot the Ethiopian wolf. Along the trail, the guide will describe the natural surroundings as well as the history and local conservation efforts.Visitors will end the day back at Regreg, where they will be briefed about the upcoming treks. Day 2: After an early breakfast, visitors will trek on foot or mule back, for around five to six hours, from Regreg to AtseWiha Camping Ground, walking through an Afroalpine meadow to “Lobelia Valley”, with thousands of these giant plants. The trail then winds its way into the moorland where visitors will experience the enormous highland flora as well as an impressive array of animal life including the endemic gelada and the Ethiopian wolf. Visitors can then enjoy a picnic lunch in the majestic surroundings, keeping an eye out for a rare and the graceful bird of prey – the lammergeyer, or bearded vulture. This raptor, considered the lord of the high plateau, can often be seen soaring in searching of food. In the late afternoon, the mules are sent back to their base and the visitors will set up camp at AtseWiha.